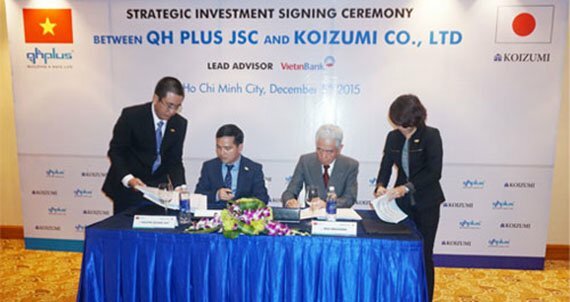 Ho Chi Minh City, the Memorandum Of Understanding (MOU) signing ceremony between QH Plus Corporation and Koizumi Group had organized successfully at Sheraton hotel – Saigon in Dec 5th 2015. 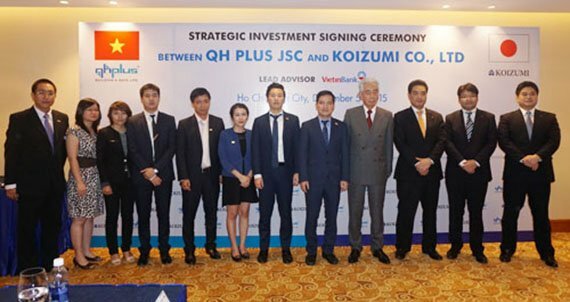 In the signing meeting, Koizumi had purchased 23% shares of QH Plus Corporation and two parties had agreed about the plans in developing multi-building accessories, contributing for the development of Vietnamese construction in the future. In the meeting, having the representatives of three sides, Mr. Nguyen Quang Huy – CEO of QH Plus, Mr. Koji Nagasaka – Chairman of Koizumi group, Mr. Cao Viet Dung – Investment team, Vietinbank - supports QH Plus in issuing shares. The Vietnamese construction has been forecasted that it is going to develop significantly in 2016. So, the collaboration between QH Plus and Koizumi is a turning-point favourable to Vietnamese building accessories and construction materials. In remarkably, Koizumi group not only transfers the-state-of-the-art technique but also shares experience in management for QH Plus. According to Mr. Nguyen Quang Huy, CEO of QH Plus; he appreciate this collaboration and underline the investment of Koizumi about technique and experience. The cooperation opens many opportunities for QH Plus and Koizumi as well as contributes for the development of Vietnamese construction next time.